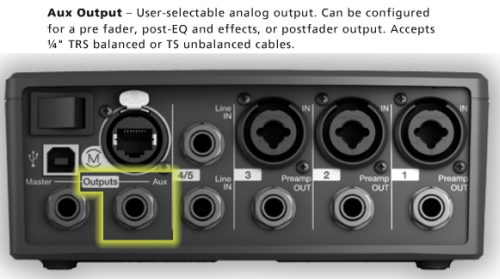 You can connect active monitors to the L1 Compact Line Out OR T1 Aux. If you need more information, please tell us the make and model of the monitors with a link to the owners guide or manual. in the preamp output 1,2,3? Or I can only output them by the Line Out OR T1 Aux? Yes, you can, but the signal at the Preamp Outputs is post-trim (only). You won't get the ToneMatch Presets, zEQ, ParaEQ, Effects or reverb. The T1 Master or Aux Outs is what most people use for monitors. The inputs are unbalanced. You use Tip-Sleeve cables. Using Tip-Ring-Sleeve cables will not perform better.